ALTech is proud to offer some of the best quality print and apply systems available in the marketplace today and consistently strive to ensure that the ribbons available for them are of the same excellent standard. ALTech branded consumables are designed and manufactured specifically for use with ALTech print and apply systems. They enhance the overall print quality and offer the best possible results whilst causing minimum wear on the working parts - in particular the print head. They are available in various grades to suit virtually any application in every market, from mass-produced short-term label printing (e.g. fresh produce), to highly specialised & long lasting identification techniques using advanced resin products. The wide choice of approved ribbons available today are the result of years of research and development. With each ribbon type offering different print characteristics, including the colour ribbon range, ALTech is confident that there is an approved product to suit virtually any application. Quality and accuracy are critical for companies producing large quantities of barcodes that need to be successfully scanned. Barcode rejection and return of products is a costly business error on many levels. Do not take the risk – use only ALTech Approved Consumables. 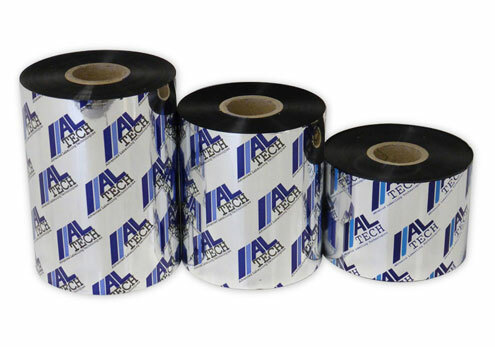 ALTech also offer a full range of ribbons for use with other manufacturers products (such a Datamax or Zebra desktop printers) at highly competitive prices – for a quotation please complete our request form to the left.